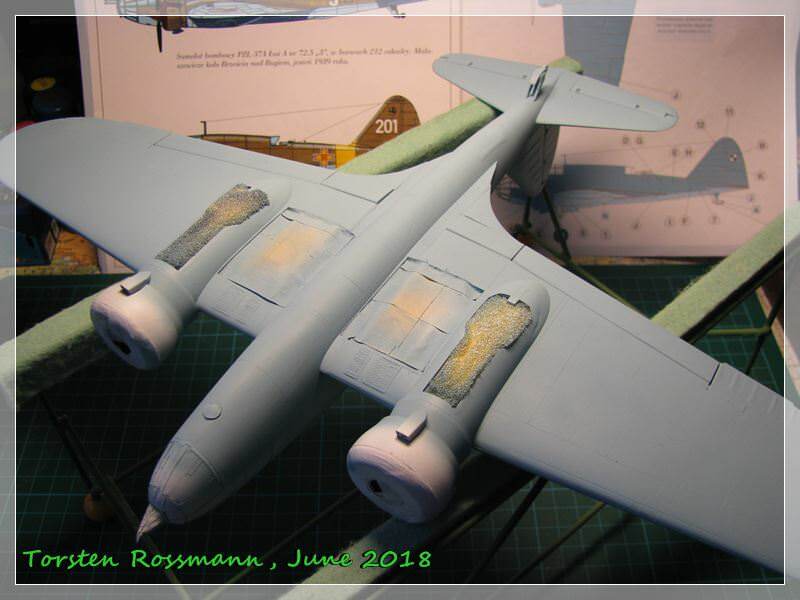 " The project's aim was to produce an aircraft capable of undertaking missions in the tactical strike, reconnaissance, air defence, and maritime roles"
Torsten: I never heard of a putty with glue and flour. 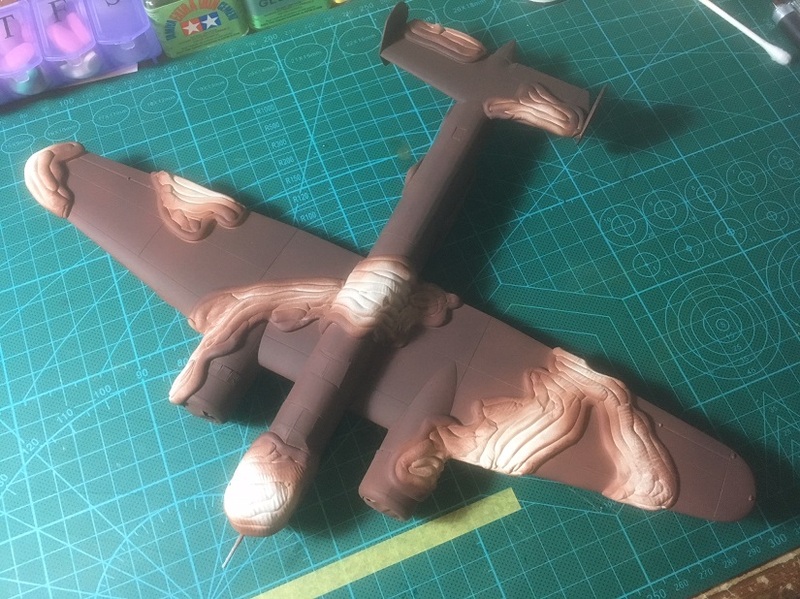 how does it work and how can You grind and paint it? Btw Your kit is coming along nicely! 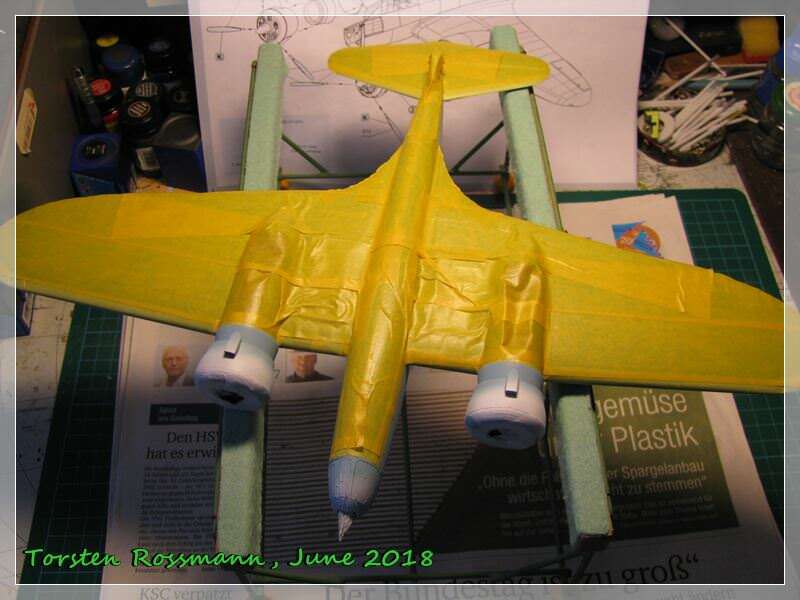 Bob: Great progress on Your Fokker. Please tell me about closing this window with glue. I never tried this before. Any experience what diameter of space can be closed by this technique? Shrimpman: I would try a post shading effect with some strongly diluted grey. 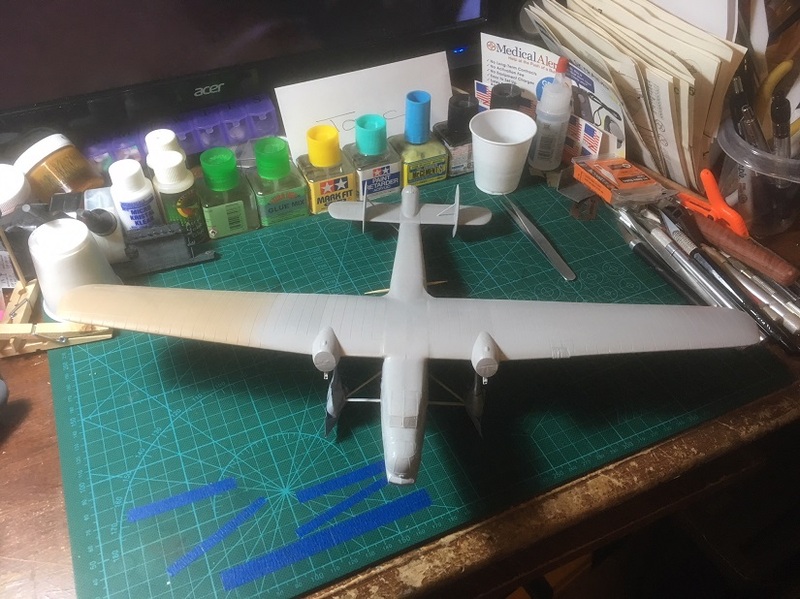 I would use a mask along the panel lines cross to the directionn of flight and spray this paint into the direction of flight. Than, I would use some black or dark brown wash to restore the panel lines. 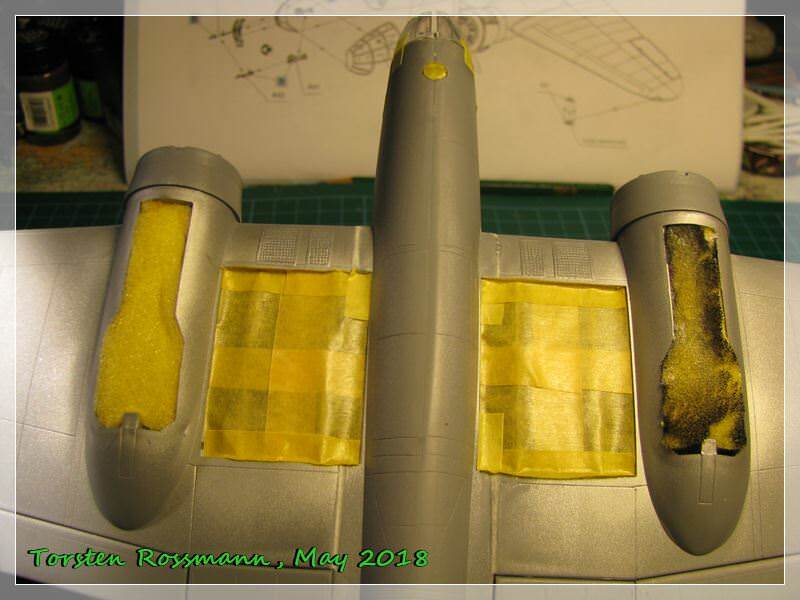 I did this on my Dornier Wal and it worked quite well. 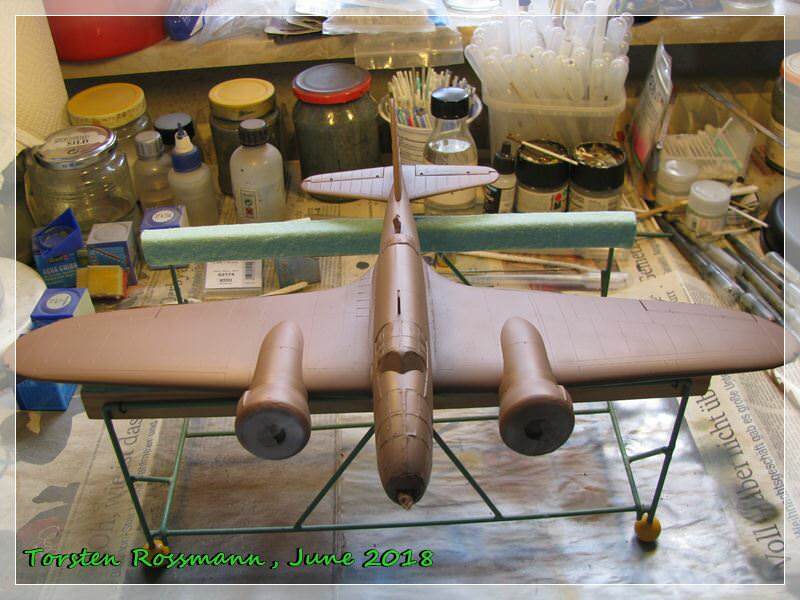 Torsten, she is looking good and I see that there is a lot of glass work. WOW! 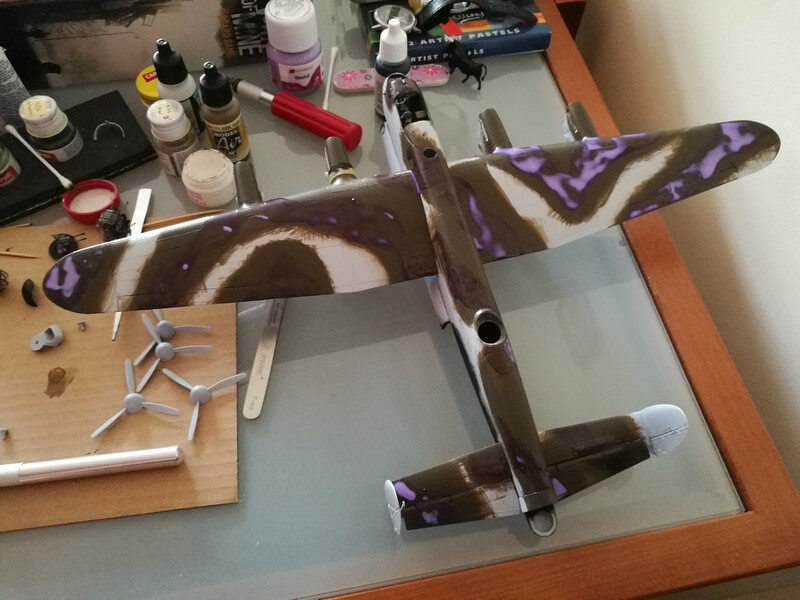 I started the paint process with some poster putty and pulled out the airbrushes after 4 or 5 months and they need to be taken apart and cleaned again. The weather here is also very humid making my filter work over time and spitting every once and a while. 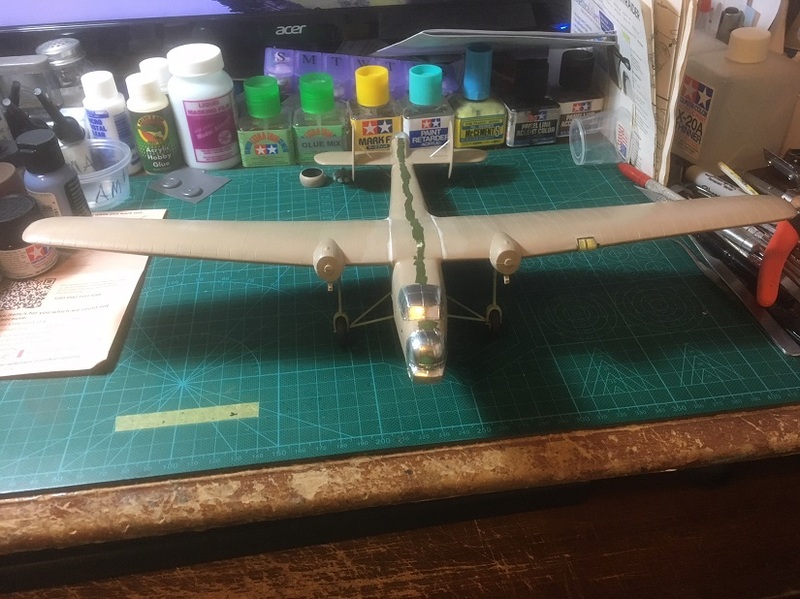 Was able to put some paint on the Fokker, but it is still drying before it hits the plastic. Guess I need to add more retarder. I found the problem with my airbrushing. It was sediment in the paint. Filtered the paint and all is well now. Torsten: Wow, the fit of the nose is really challenging to say at least! Good luck with curing this one! 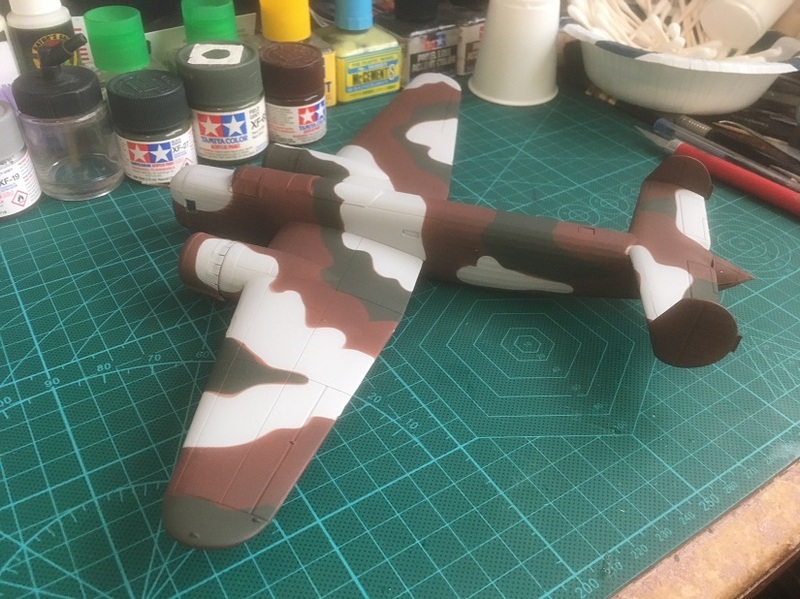 Bob: Nice progress on the paint job. 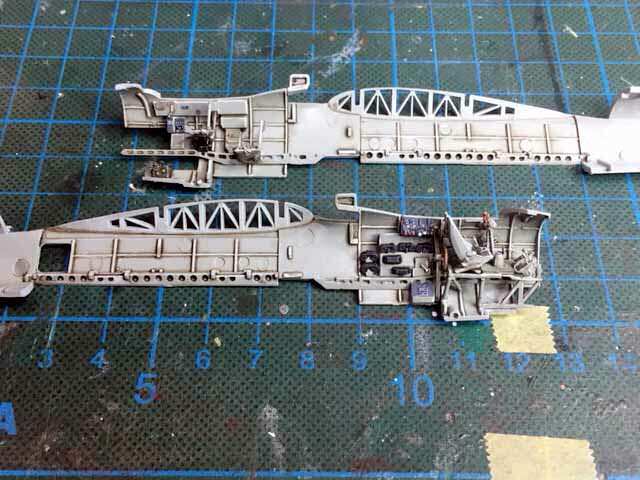 Did the Fokker had a dark lower surface? 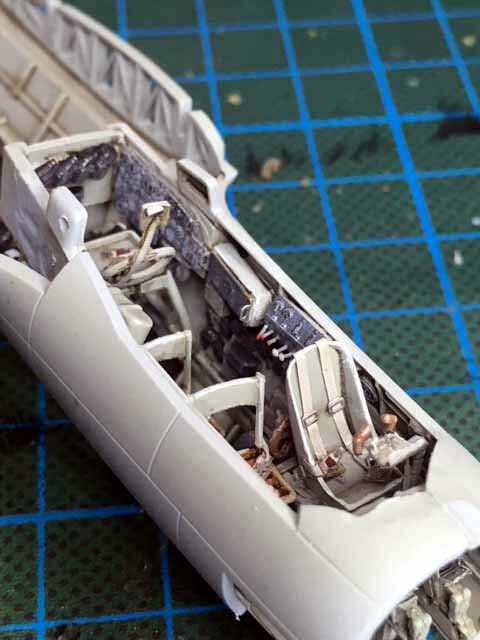 On my Dornier I started with the interior work. 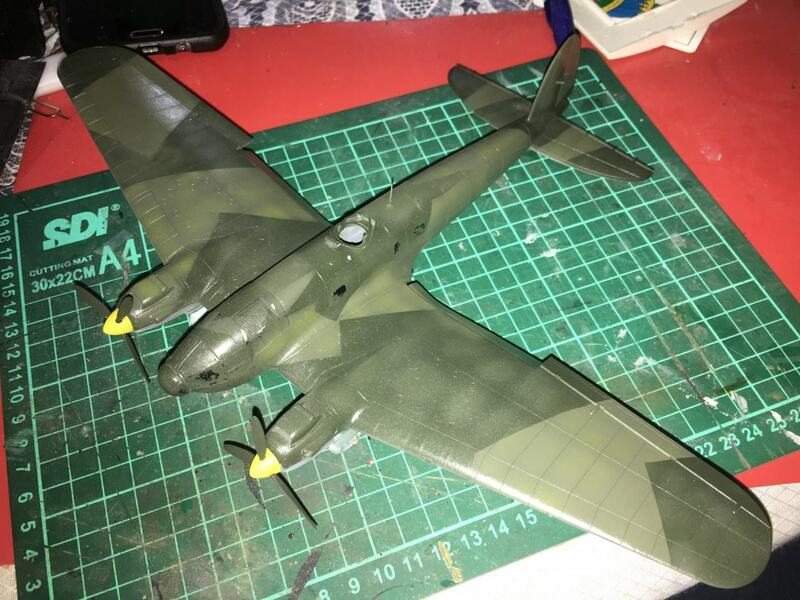 The Airfix kit is nicely detailed, so I did not really needed the PE Parts. 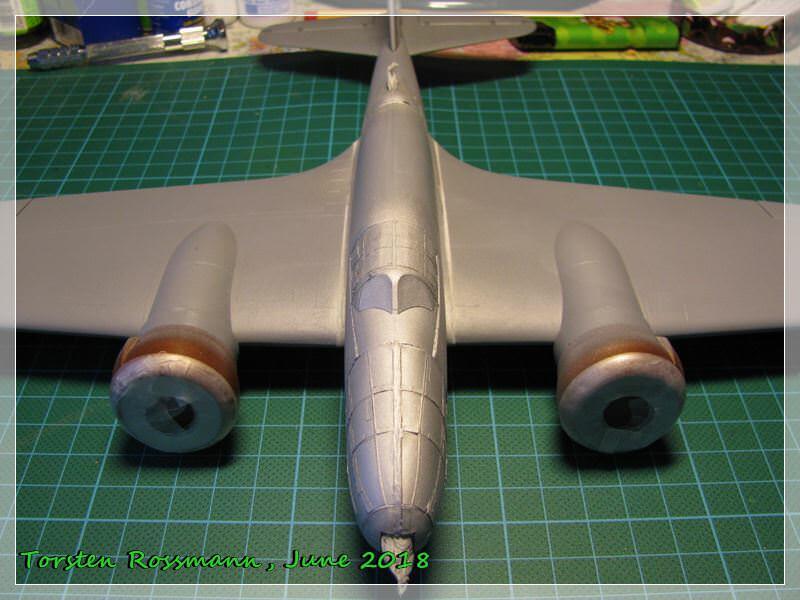 The fitting of both fuselage halves was a bit tricky. But now, the cockpit looks really nice. 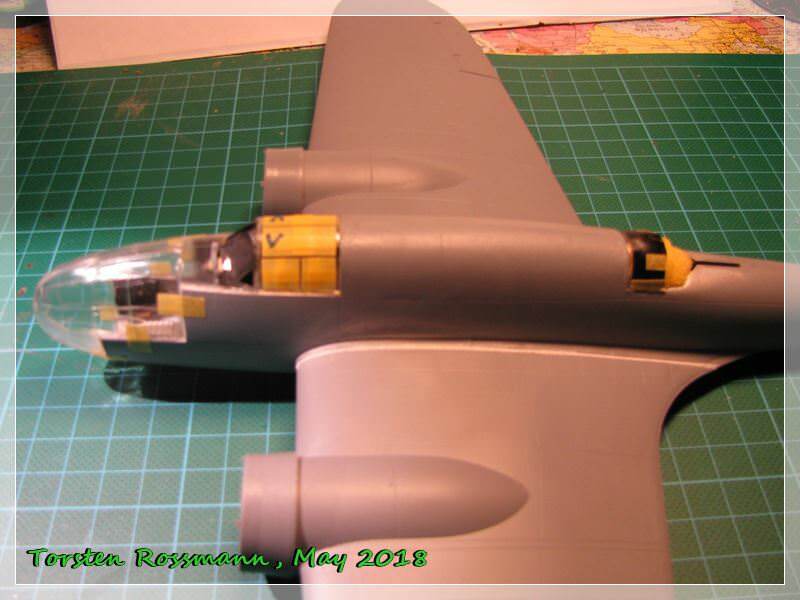 Hopefully, something of the interior work is visible after glueing all parts together. 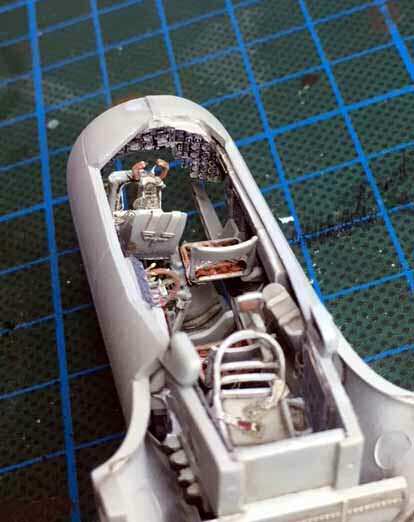 The instruments panel was enhanced with some additional wiring, as this area is clearly visible through the front windscreen. Oliver, I am using Valoms art in their instructions as a guide and they show the dark brown on the entire under surface. So with out any real research I am at the mercy of VALOM. 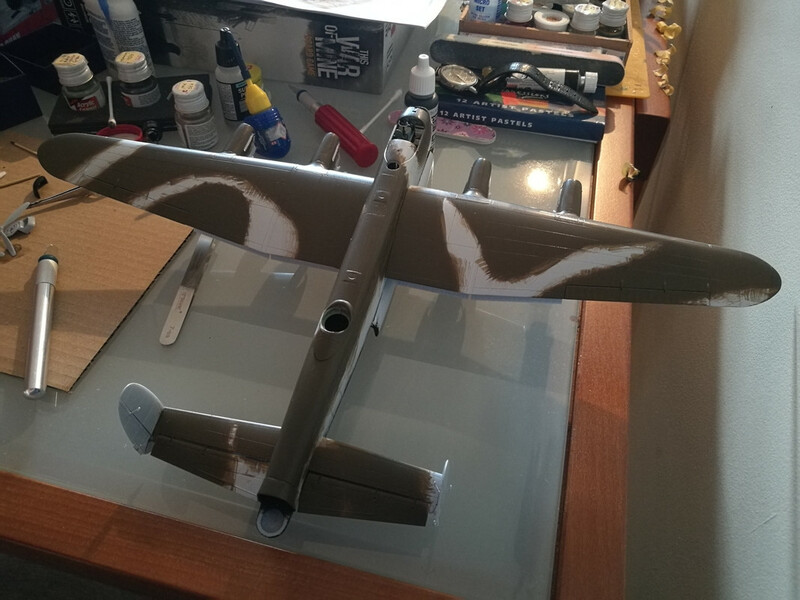 Here is a little update of the Fokker color scheme. I am not happy with the seperation of the (3) colors. If you look closely you can see the brown inbetween the green and gray. I will need to fix this, but not sure how just yet. 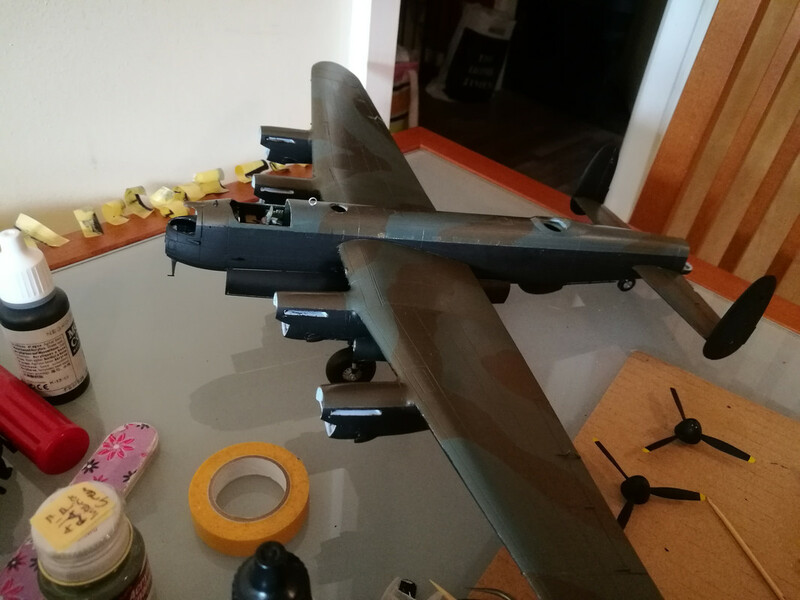 Some progress pictures of my Lancaster. 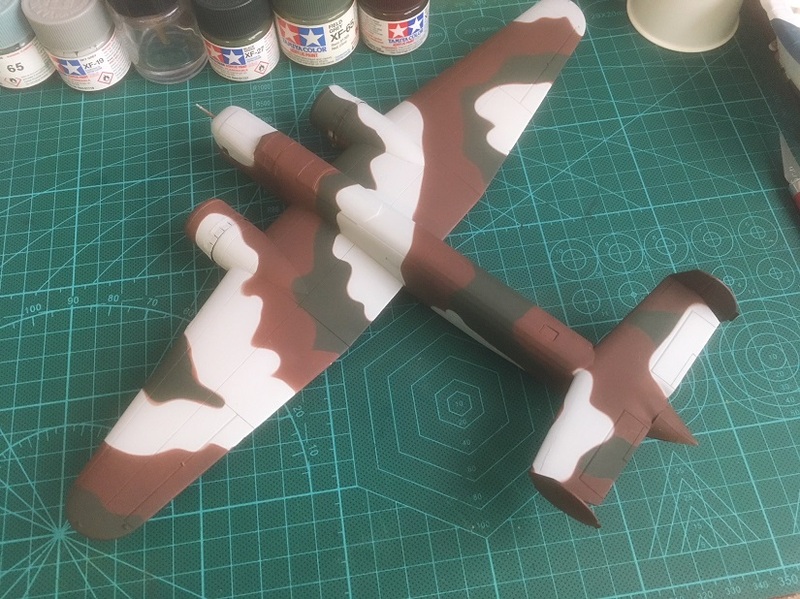 I've started the camo with brown. I've discovered Vallejo Air works very well with brush. 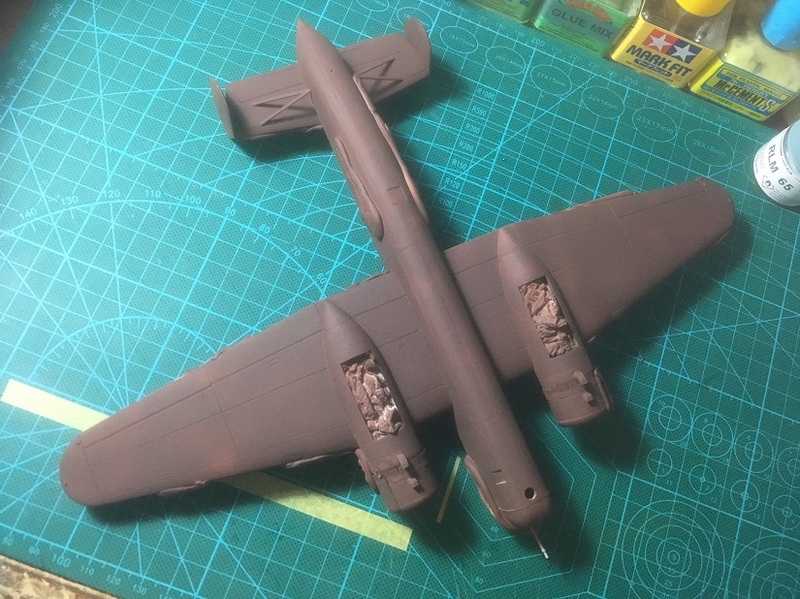 It is already very well thinned, so after adding a drop of water as a retardant I can paint without any visible brush strokes. The end results is 5 layers, as thin as I could possibly manage. I'm quite happy with the effect, surface is as smooth as if sprayed on. Below is the prep for green colour. I used Humbrol Maskol thingy (still wet on the picure). By shortsightedness I used my favourite brush for this, doh! I think brush is ruined, but I will try to get this stuff off it. Thanks Bob! It's 32 windows to cover, 16 per side. Took me an evening to do that. 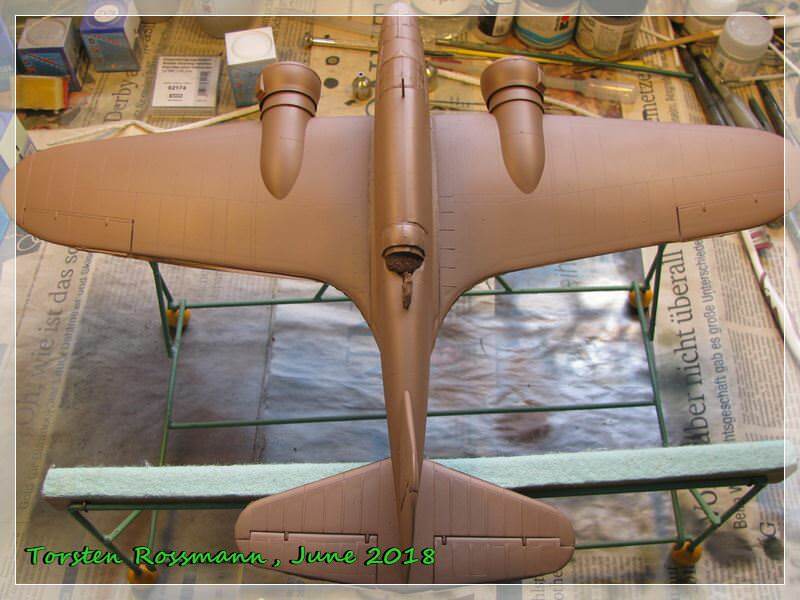 .... she's now slowly coming into shape and the next step will be the primer. Usually it takes me 4-5 weeks to complete a build. With this one I'm already in week 6 but finally I can see a small silverlining at the horizont. 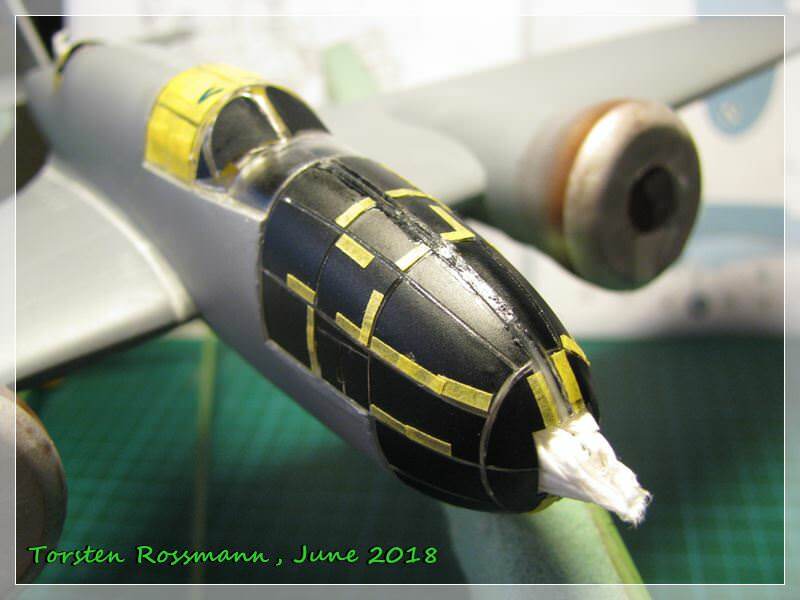 But it will be again on hold for a couple of days, because we have our own expo in Mannheim this coming weekend and I still have to do some organisation work. So it will be Monday when I take the next step on the Los. 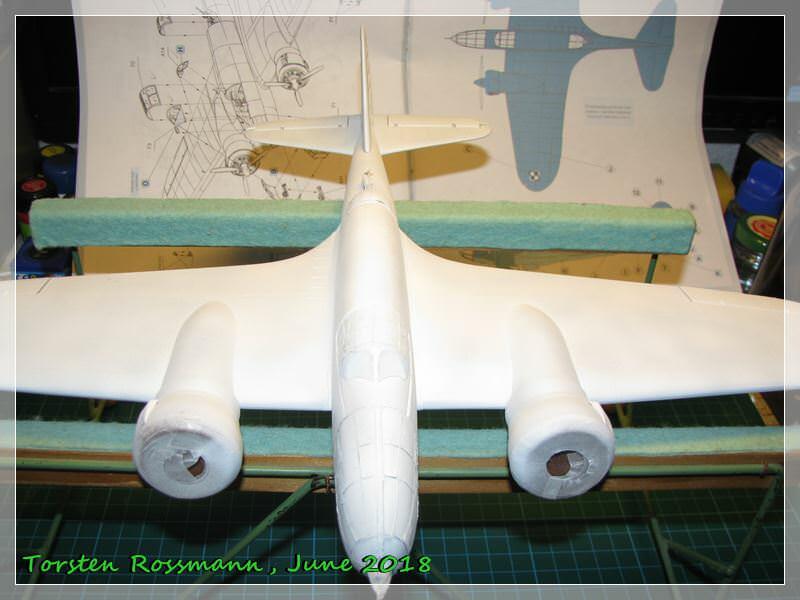 By the way, a few days ago I found a nice vid on Youtube showing a beautifully made replica of the PZL 37. It's all in polish but it shows some interesting details of the real deal. Enjoy it! 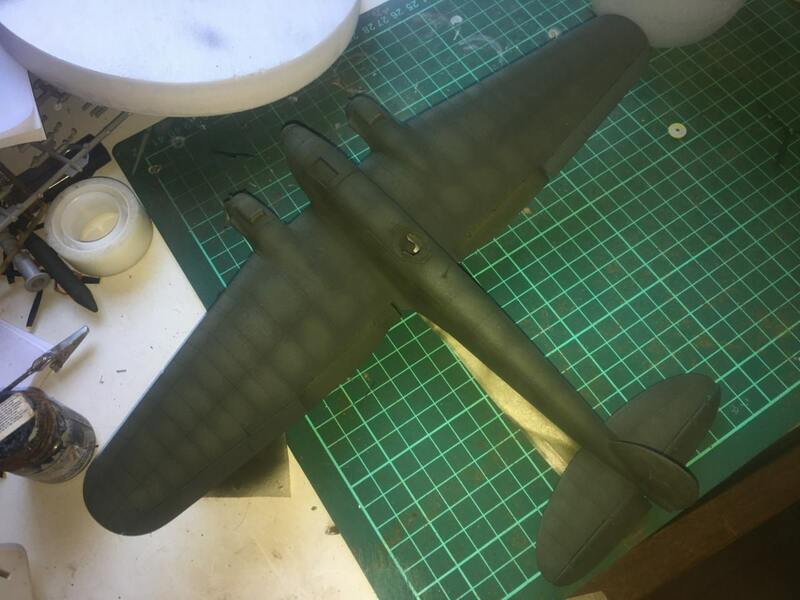 I've made some progress on the Ju88A-4. I am following this with a lot of interest. 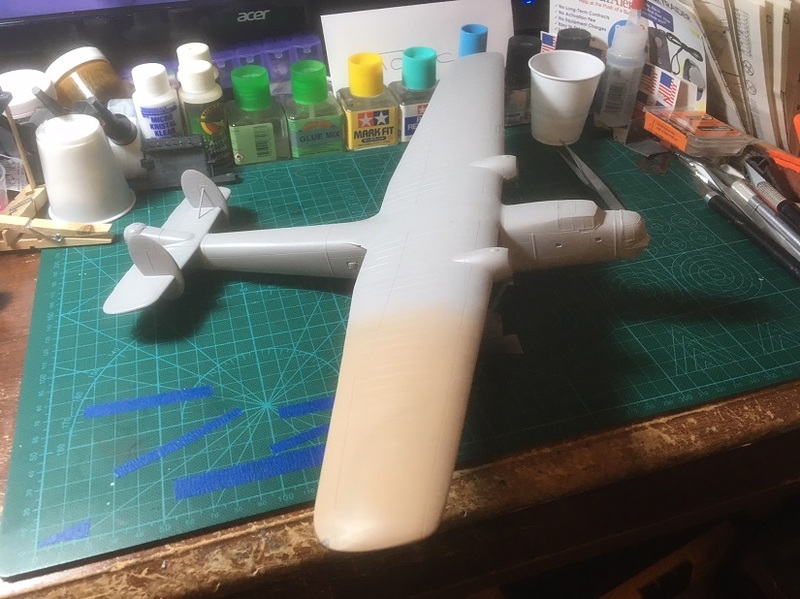 I am doing a B-25 as a first aircraft (usually do ships). 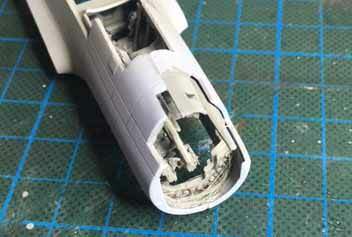 Do you leave the clear parts masks on during the whole painting process? 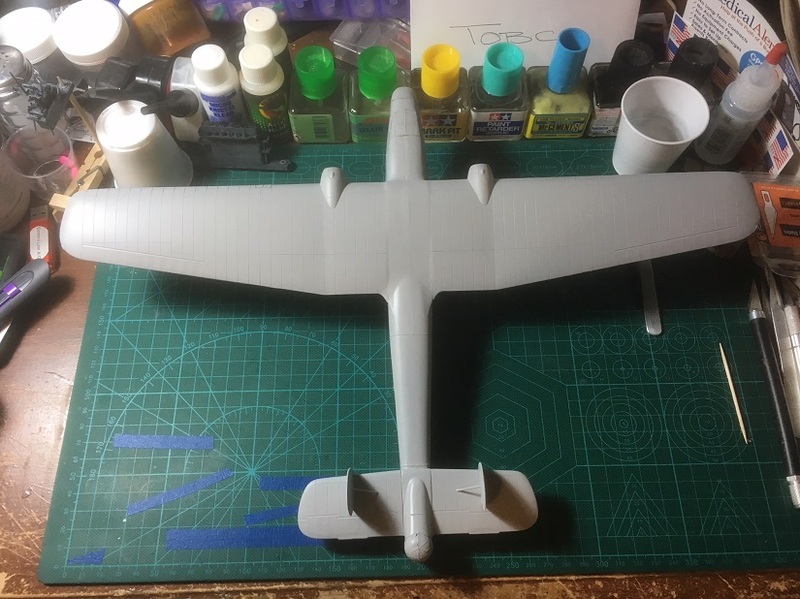 Primer, OD top, gray bottom, clear for decals and then a matt? Probably a dumb question, just wondering how long the masking will last and still peel off OK.
Darrell, yes, you're right. 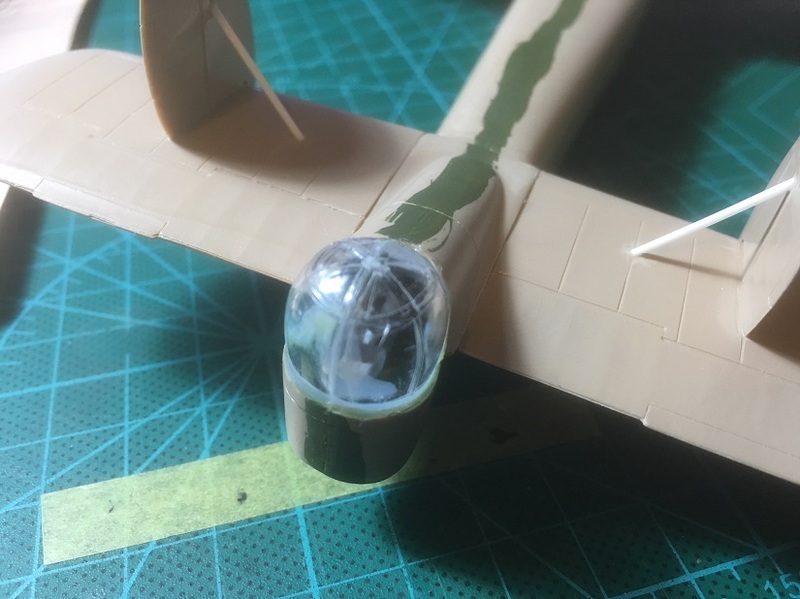 Mask the clear parts before the first coating and leave the masks on until you've completely finished your model. It's usually the last thing to do. You can have a look at my Peshka and other builds during the Soviet Phoenix Campaign. If you have more questions, don't hesitate to ask. There are no dumb questions, only (sometimes) dumb answers. 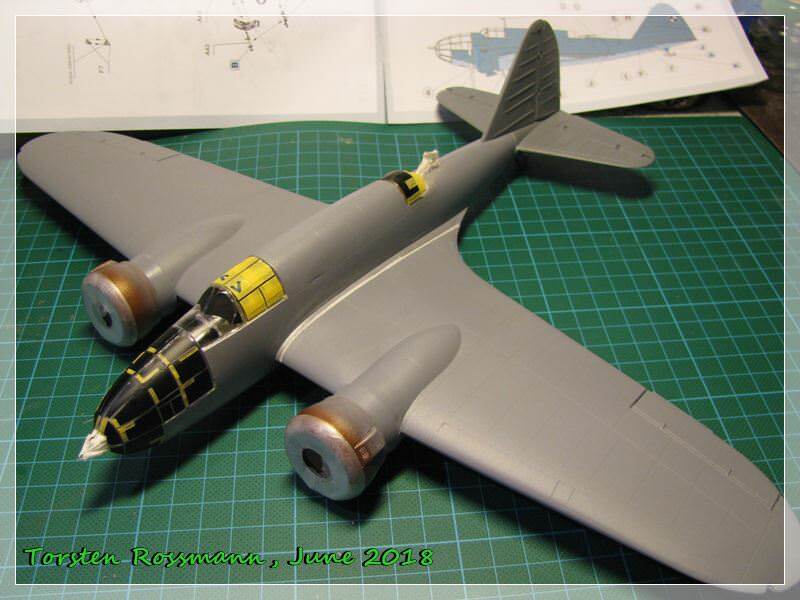 Oh, and show us your B-25! FWIW, on my Boeing Clipper, I masked the windows before primer, left the mask in place through the silver coat, overcoat, and future. Pulled them off after decaling and before final overcoat. When I pulled them off, in a couple of cases they pulled up the adjacent paint. I had to touch them up before the final overcoat. Next time, I'll try pulling them up before the Future and see how that works. 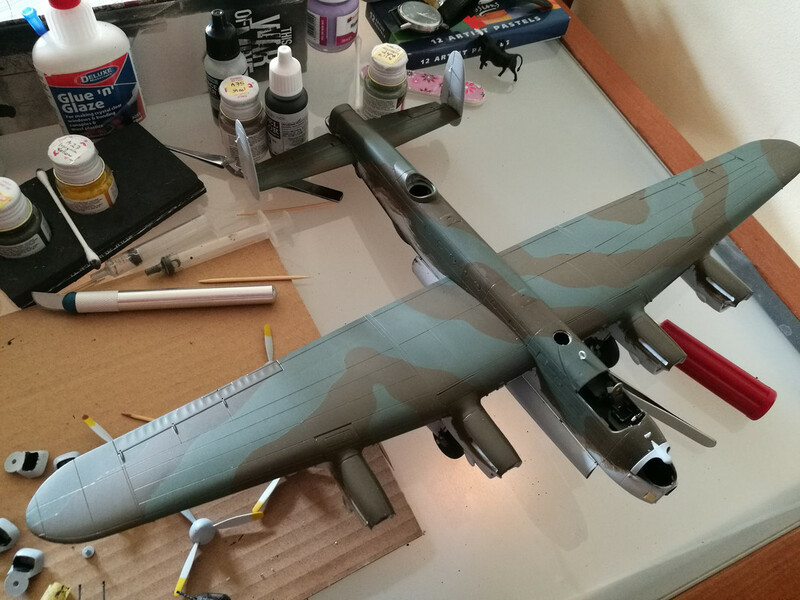 Just a quick update on my B-24. 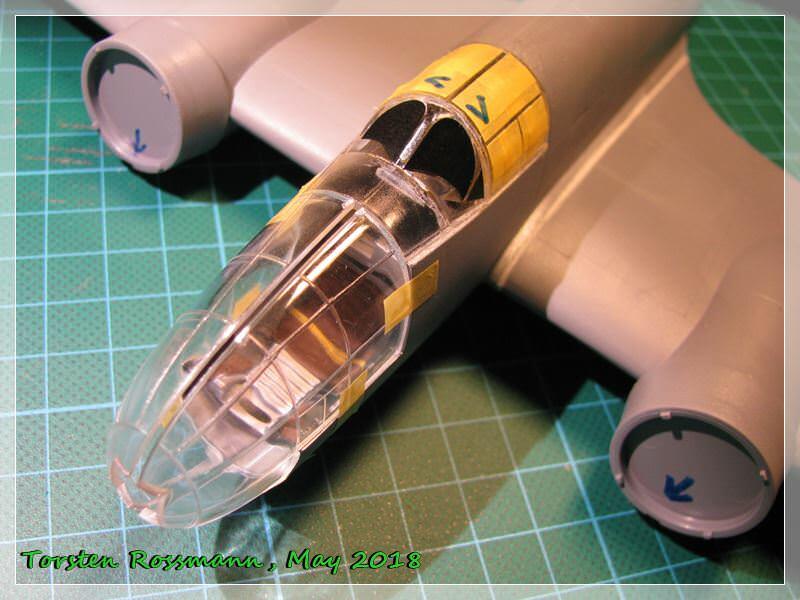 Painted the interior using a mix of Tamiya XF-3 (yellow) and XF-5 (flat green) 2:1, then diluted 1:4 with Mr. Leveling lacquer thinner for the interior green. I think it looks the part. 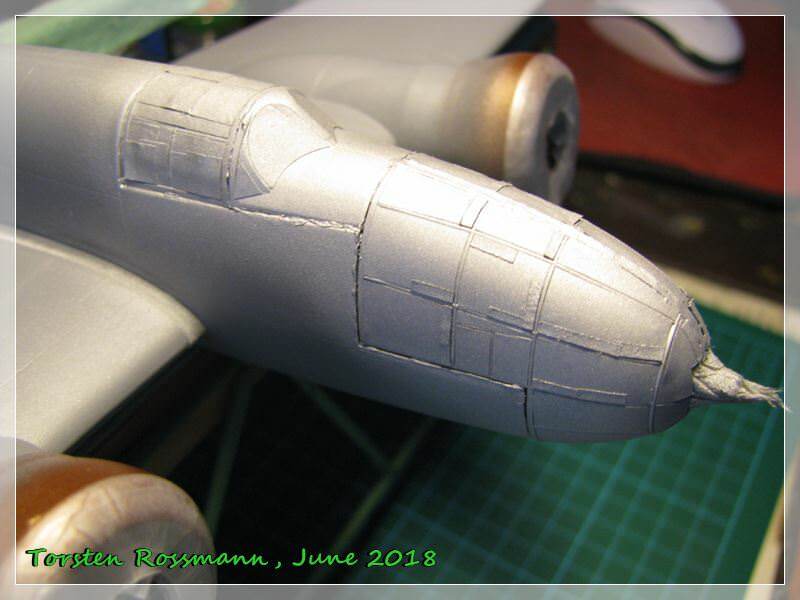 I find, for airbrushing, the lacquer works very well with Tamiya paints, and well, it levels it all out! 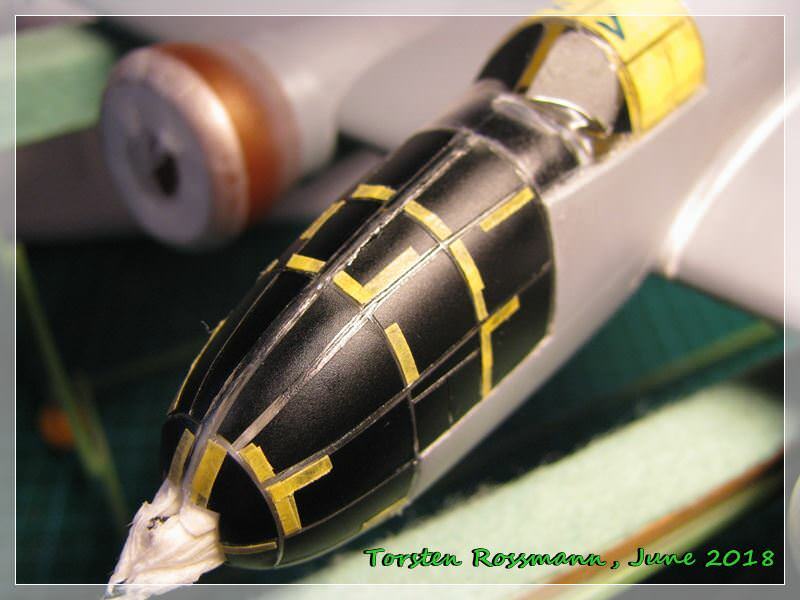 For the Zinc chromate yellow I used XF-4 yellow-green, and for the aluminium I tried XF-16 flat aluminium. All thinned to a 1:4 dilution, I've also used plain lacquer thinner and have gotten similar results. 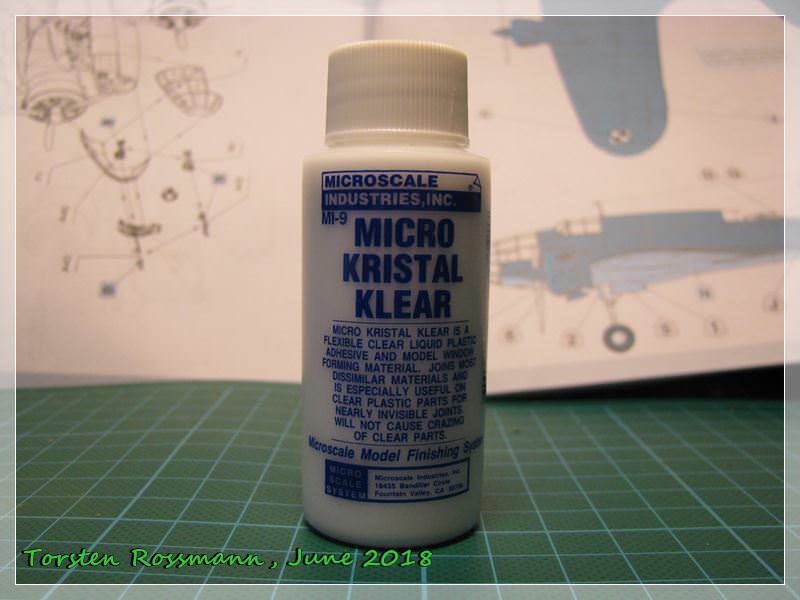 However, given that off the shelf lacquer thinner here also contains toluene, I'm inclined not to chance damaging the plastic. 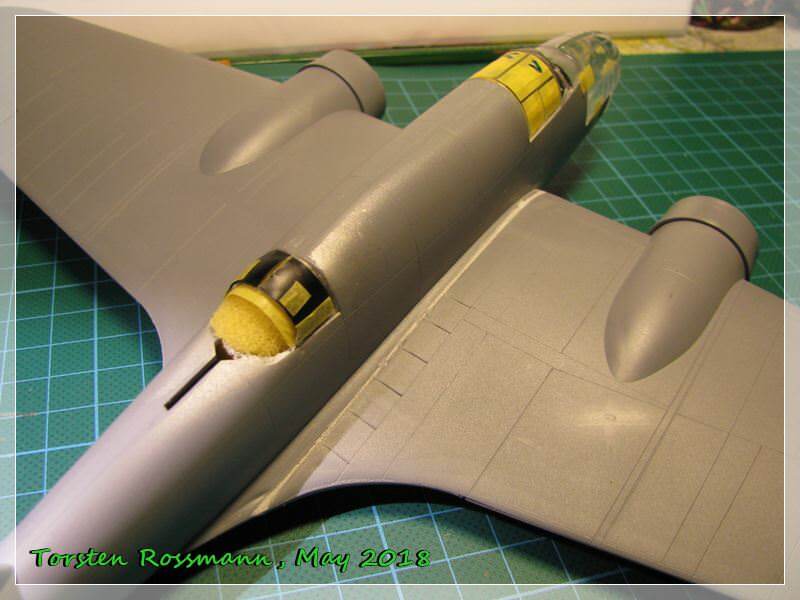 I then picked out instruments and other interior detail using NATO black and Neutral Grey. Since I don't have an inexpensive supplier for paints, I've gone the path of Tamiya and Mr. Color. I'm also modifiying a method on brush painting with Tamiya paints, more on that later. Darrell, Welcome! I agree with Torsten, and no, there are no dumb questions. Torsten, I like using the Krystal Klear as well, you did a bang up job closing that gap. Another update! 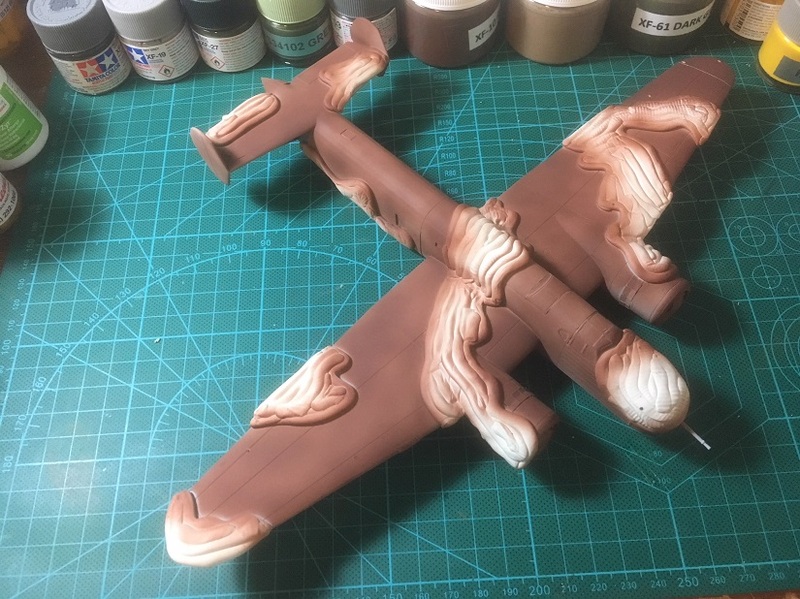 Since doing all the interior base colors, I turned my attention to the wings, as these will be the hardest part of the build. 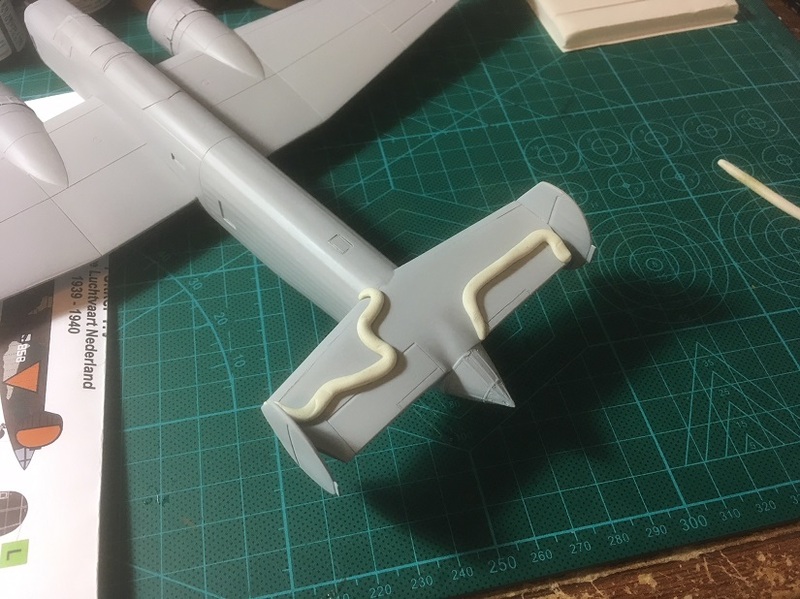 So, it would seem that all the practice on seams from the C-47 will be paying off! These will be a challenge to say the least. 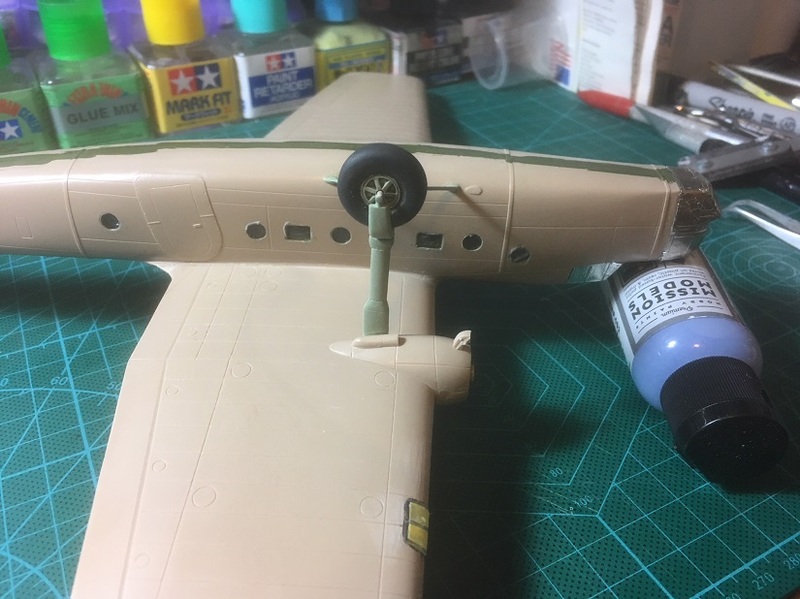 Also, in my zeal to get going, I neglected to put in the brass tubing for the props (I tend to do this on older kits that I think will have prop droop). Not a killer, but another challenge of my own making. I was cleaning up and reorganizing today and found the clear parts that popped off the Bristol Bombay when I dropped it some time back. 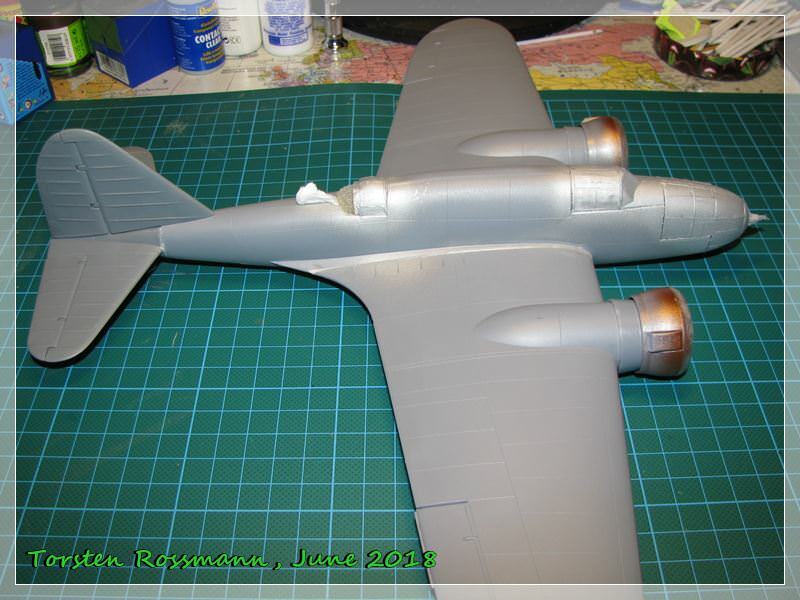 So Ill continue this build also along with the Fokker TV. 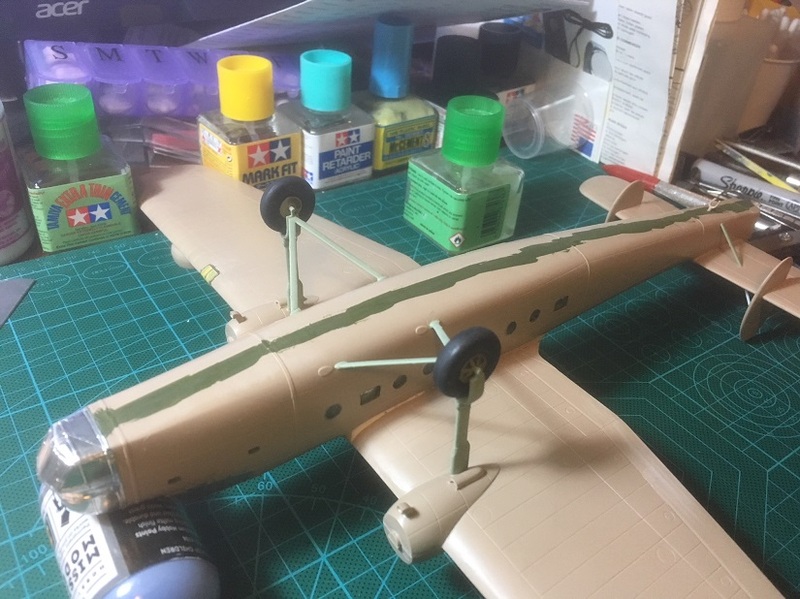 I also built up the courage to attach the landing gear. There's quite lot of room for crew. 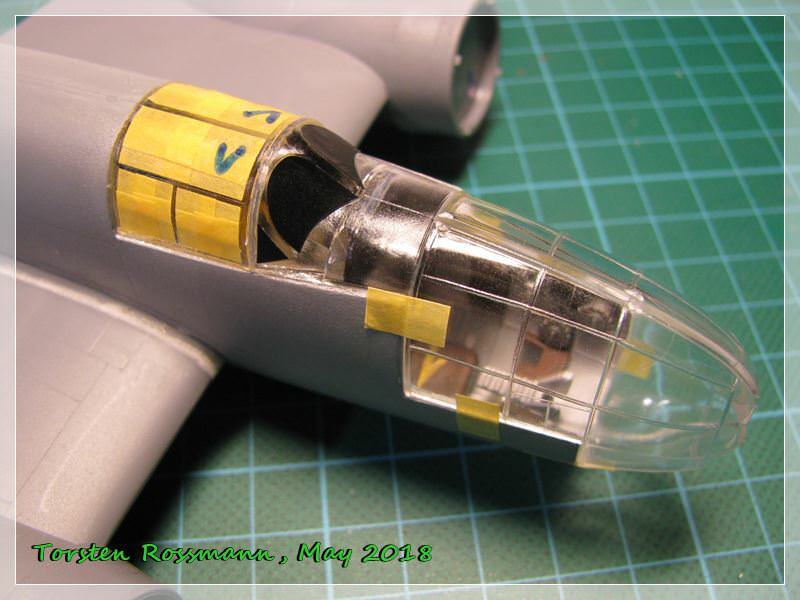 Next I'll face least favorite part, which is removal of ejector pin marks from insides of fuselage halves. 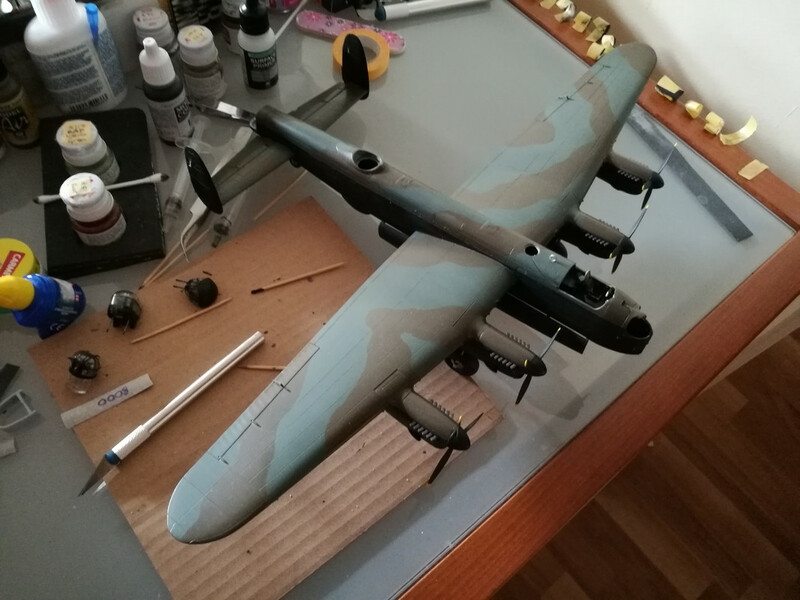 Some progress on my Lanc over the last couple of weeks, next step is decals. @Oliver: The Do-17 its a beaty..... 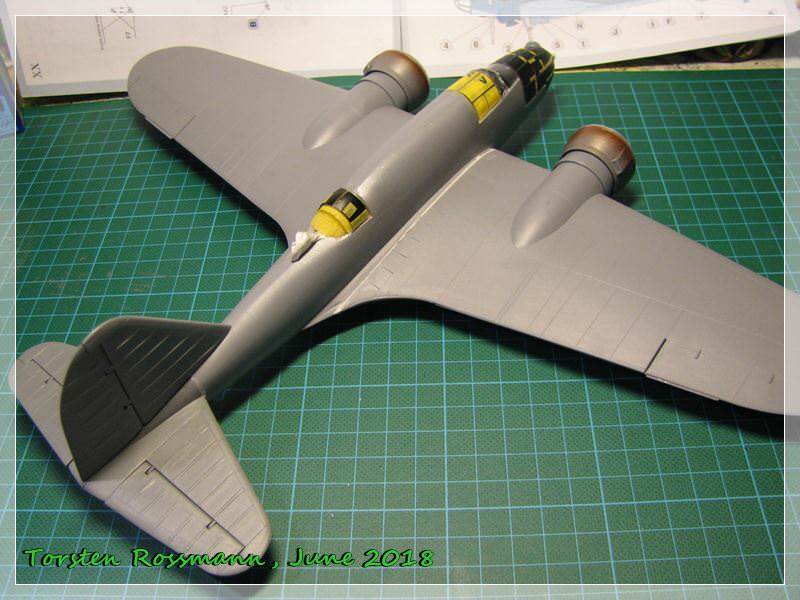 I don´t know how beatifull was the Airfix kit. I prefer to buy the ICM some time ago. @ Joe D'Oh. Should have thought about that. Well I've got a lot of windows coming up on some new projects. I'll try that trick soon. Nice work on your builds, guys! Like it! 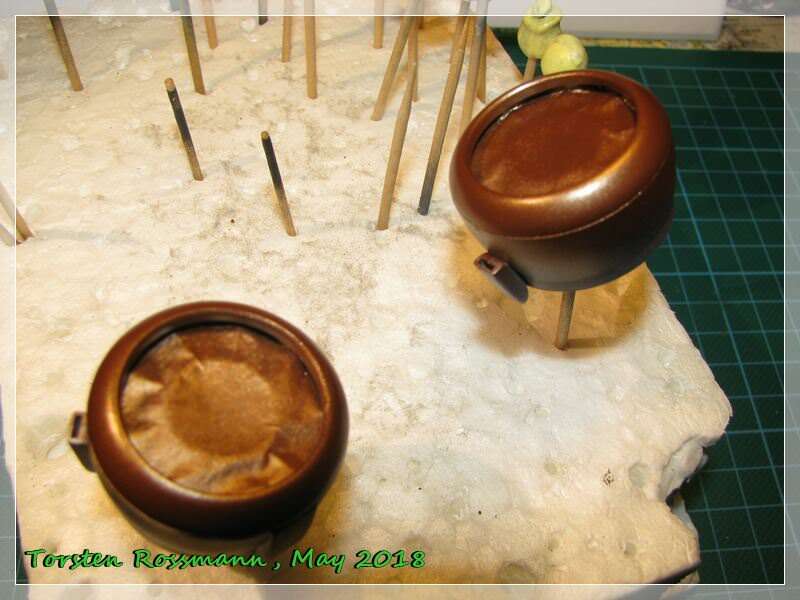 Anyway, have done some major progress on the "Los" in the past 2 weeks after the end of our expo. Jose, the HeIII is looking good. 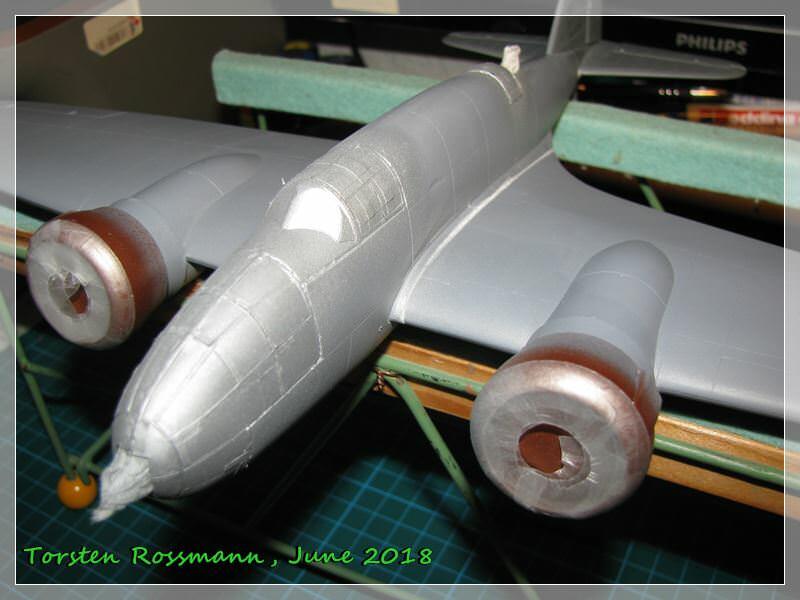 Torsten, this is an unusual a/c and I love how it is progressing. Looks like I will have (2) a/c finished for this campaign. 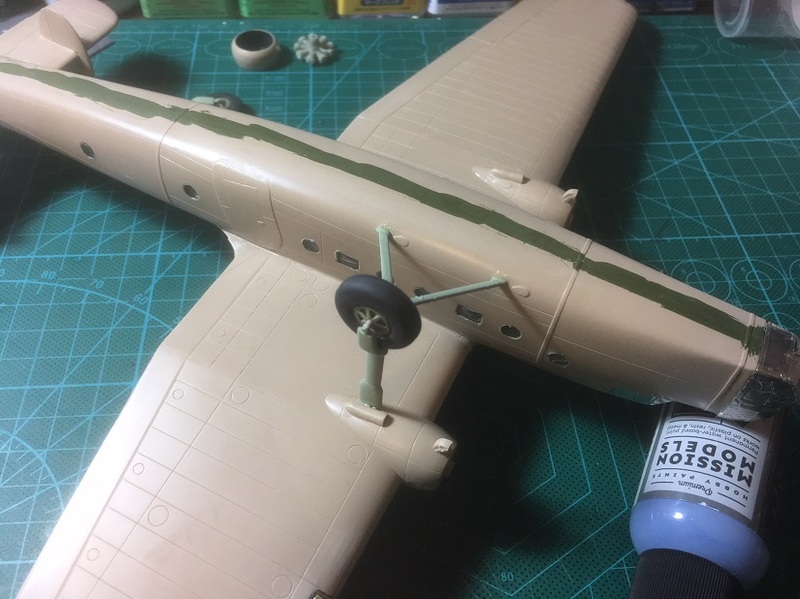 I started the primer for the Bombay, but still need to apply the fiddly stuff on the Fokker TV.